Amazing. AMAAAAAZING! There are many amazing things I've experienced ever since we made that long journey across the country some years ago, but getting to see Pee-wee Herman perform live on stage was the fulfillment of a childhood dream. The guy is a comedy hero for me and I couldn't even begin to count how many times my friends and I have quoted lines from Pee-wee's Big Adventure over the years. So the show was taking place at Club Nokia, which from the outside appears to be a huge place since it's right near the Staples Center here in LA, but the truth is that it's a very small venue. As a result, the seats we had were amazing and it felt like a very up close and personal performance. I can't really explain just how excited I was when Pee-wee first came out on stage, and I was instantly whisked back to my childhood as he made the entire audience stand up and say the Pledge of Allegiance before the show begin. And when those curtains rose to unveil his playhouse, complete with all of my favorite characters such as Conky, Chairry, Magic Screen, Jambi and more... man oh man... I was a kid again. Seeing that amazing playhouse set right before your eyes with Pee-wee and the rest of the gang was nothing short of amazing. 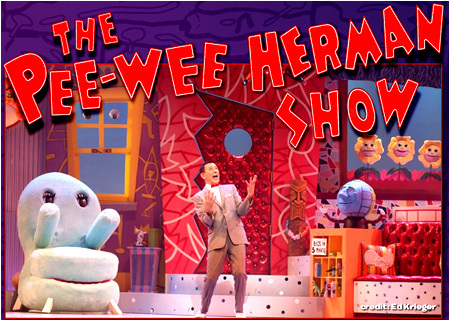 Remember, before the movies and the TV show, the Pee-wee Herman Show was performed on stage at the Groundlings Theatre in the early eighties, so this was essentially Paul Reubens returning to his roots. I have to say, while he's obviously a bit older now, Paul is looking great for his age and his performance as Pee-wee did not disappoint in any way. Running around the stage frantically, making everybody in the audience scream the word of the day ("FUN! "), singing songs, and basically doing everything that made the Pee-wee character so memorable in the first place... Paul didn't miss a single beat. What none of us expected, however, was what happened after the show. 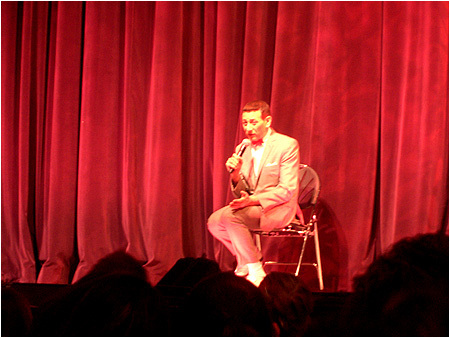 Since this was his their last performance before having their first day off in a month, Paul sat down with the audience (still in his Pee-wee costume) and had an extremely long Q&A session with the audience. He's been doing Q&A sessions after all of his shows, but he's had to cut most of them short, 20-30 minutes tops. Ours was well over an hour, and you could tell that it was because he really wanted to be there and was so happy to see that people still loved the Pee-wee character that much after so many years. Seeing him give advice to a little girl about following her dreams about becoming an actress was simultaneously heartwarming and inspirational. All in all, it was an incredible evening, and I really hope Paul gets to make the new Pee-wee film he's been talking about for a while now. Also, for those of you not in LA, he didn't confirm it, but there have been some hints that the show may go on the road to a few places as Vegas and Broadway were both mentioned. I'm hoping they'll put it out on DVD as well considering how much effort and work clearly went into this big production, but it's really something you have to see in person. So keep an eye on the world of Pee-wee Herman, and if you have the opportunity, do not pass up the chance to see that show. On a final note, as if the show wasn't amazing enough, before Pee-wee ran off the stage, he took off his ring and threw it out into the crowd. Take a guess who caught it? Yep, I like to think that my childlike fervor for Mr. Herman willed that ring to come my way so I could then give it to Re to end the show on a perfect note. I-Mockery Visits the Cabazon Dinosaurs! The Story of Large Marge! Now if you'll excuse me, my bike is missing and somebody told me they saw it in the basement of the Alamo. The Good, the Bad, and the Pee-Wee! What secrets were spilled during the Q&A? I was so bloody psyched when I heard about this show. But sadly I live out here in Detroit: Land of...well nothing really. Best I can hope for is the DVD. Good to know somebody got to see it! I remember that show RoG, I loved it when I was a kid, 30 minutes of nonsense on a Saturday morning, I didn't even care if Ninja Turtles was on another channel. I like the ring story. You caught the ring? That means you are the NEW Pee-Wee. *Bows*. Awesome post, man! I loved watching Pee-Wee growing up! Didn't know he was doing live tours and whatnot. Awesome,I always hoped Pee-Wee would make a return. I do believe that the UK missed out on Pee-wee. Oh and RoG the problem hasn't reoccured so cheers for the fix. Yes, with the ring you now possess Pee-Wee's POWER. How much of the original Pee-wee Herman Show is in this new one? Does Dr. Mondo make a return? 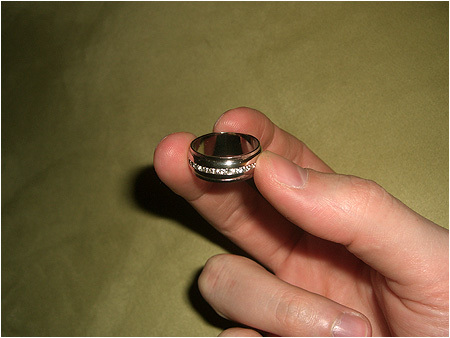 If you put the ring on during a full moon do you morph into Pee-Wee? Do your shoes tunr into platforms? Does your laugh change into his? The fates smiled upon you when the ring ended in your fist. The nostalgia is so thick you could cut it with a knife.i think i burnt out my vhs copy of peewees big adventure from constant watching. that movie and peewees playhouse was like heroin for my little child veins. I always wanted MORE! Its a shame he got such a bad rap after that stupid incident. For another ring was made. In the land of Mordor, in the fires of Mount Doom, the Dark Lord Pee Wee forced in secret a Master Ring to control all others. That sounds really cool! and can you post a picture of the ring? Even if is just a simple ring i would like to see it! Ron Davis, much of the original cast was there including Jambi, Miss Yvonne, Mailman Mike, etc. But no, Dr. Mondo wasn't there. Oh joy. I bet that Re likes that! I think the ring looks pretty freaking cool. Who knew such an energetic and flamboyant and over the top character like Pee Wee can have such a well.... down to earth ring. Damn cool, sir. Couldn't have happened to a nicer guy. So if you put that ring on does the ever-seeing eye of Large Marge become aware of your presence? Ot looks really cool! I still can't believe that of all the people there you got the ring!! Now you have some of the super powers that Pee-wee has! I have a dvd of this performance from the 80's or 90's. It rules. Oh. It's called "The Pee-Wee Herman Show - Live at the Roxy Theater". It was filmed in 1981! Seriously though. Rog, I've never wanted to be you, but there are times man... there are times. I sure hope this show goes nation-wide as there's no way in hell I can justify flying to LA just to see it. So the part where you saw the old Pee Wee Playhouse set from the tv show, did they perform like a skit? Was Chairry talking and everything? I would of love to seen that. Man, now I wish I didn't move from LA two years ago. Stoooopppiiidd! Stooooopppiiid!!! I could have gone to see Pee Wee!!! ARRRRGGGHH!!!!!! The ring is cool. You may want to keep it handy, it may be useful, if you and Doc Mock go at it again. Previous post: This Friday: The Return Of Doc Mock! Next post: New Doc Mock Tonight @10pm PST!